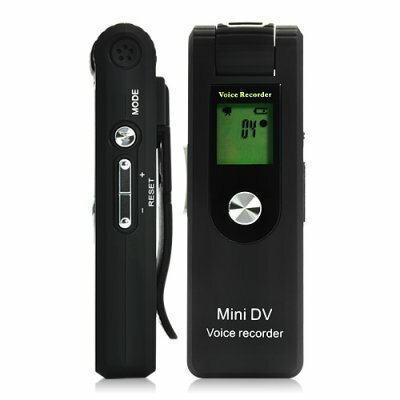 Successfully Added 4 GB Digital Video and Voice Recorder + MP3 Player to your Shopping Cart. It does it all! Video, audio, photo and MP3 player- jam packed into this pocket-sized device. The I94 is the perfect gadget for documenting meetings, recording voice memos or simply listening to your favorite MP3s with. That’s because this all-in-one multimedia device comes in a pocket-sized form factor that’s convenient to carry and features 4GB of internal memory to store and record hours of video, audio and MP3s. The clip-on design and built-in loudspeaker make it great for listening to music with; while the 3.5mm headphone jack let’s you use your favorite HiFi headphones when convenient. Recording video with the I94 is easier than ever thanks to the 90 degree swivel lens and quick-record operation. Need to record audio only? Then you’ll be pleased to know that the I94 can record over 500 hours directly to the internal memory! The I94 is perfect as a standalone video player, audio recorder or even MP3 player. The best part? While if purchased separately you’d spend upwards of $150, the I94 comes to you direct from the factory at a wholesale price that cannot be beat! Order now while supplies last and we’ll express ship your order out within 24 hours. Video is automatically saved and recorded to a new file after 60 minutes. Audio after 180 minutes.